A Gantt chart is a type of bar chart that illustrates a project schedule. Gantt charts illustrate the start and end dates of the terminal elements and summary elements of a project. Terminal elements and summary elements comprise the work breakdown structure of the project. Field label Field containing the record label of the Gantt chart. You can choose which field will appear within the left column to describe the tasks. Width Gantt chart width. The default unit for this width is pixels, however you can also apply it in percent by adding the “%” sign after the number (i.e: 100%). Height Gantt chart height. The default unit for this width is pixels, however you can also apply it in percent by adding the “%” sign after the number (i.e: 100%). Months Allows you to set the number of months that will be displayed in the Gantt chart. Start Date Using this combo box you can choose the field that stores the start date, you need to have this record within the connected table. End Date Using this combo box you can choose field that stores the end date, you need to have this record within the connected table. 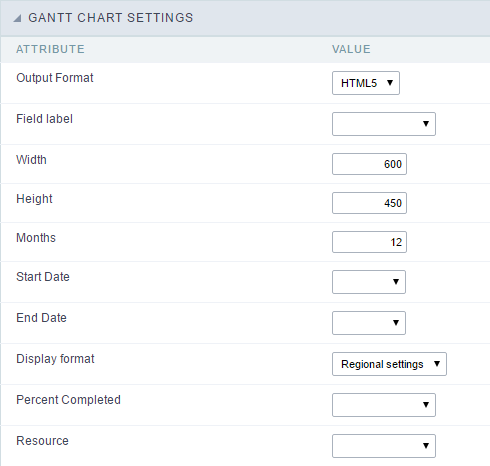 Display format Allows you to set the display format of the fields date type. Percent Completed Using this combo box you can choose the field that stores the information regarding the task completion (percentage), you need to have this record within the connected table. Resource Field containing the name of the resource allocated to the task.